Taylor's latest thriller starring Pike Logan. This time, America’s enemies plot to subvert the Global Positioning System with the Polaris Protocol, a nefarious piece of computer code that threatens to wreak havoc with commercial transportation as well as America’s ability to hit military targets with precision. Logan’s Taskforce faces a couple of formidable adversaries, including the Ghost, an Arab terrorist who also appears in Enemy of Mine (2013), and the Sicario, a bloodthirsty Mexican assassin. Taskforce member Jennifer Cahill also must rescue her kidnapped brother, Jack, complicating her role in saving America. Here, as in other Pike Logan thrillers, America faces a potentially devastating threat; only the extralegal Taskforce can save the day, and that will happen only if Logan bends the rules. His semisecret girlfriend, Cahill (code name Koko), will continually need to prove she belongs on the team, which she does in impressive fashion. The Cold War may be long over, but the struggle between good and evil continues to provide fodder for nail-biting adventures. 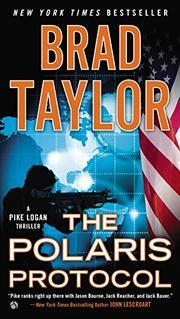 Admirers of the late Tom Clancy will enjoy this and other works in the series. Read them in any order.